What Does It Mean to Strike Off a Company? Striking off a company’s name from the register simply means deregistering the company from the Register of Companies. The eventual outcome is that the company will be dissolved. 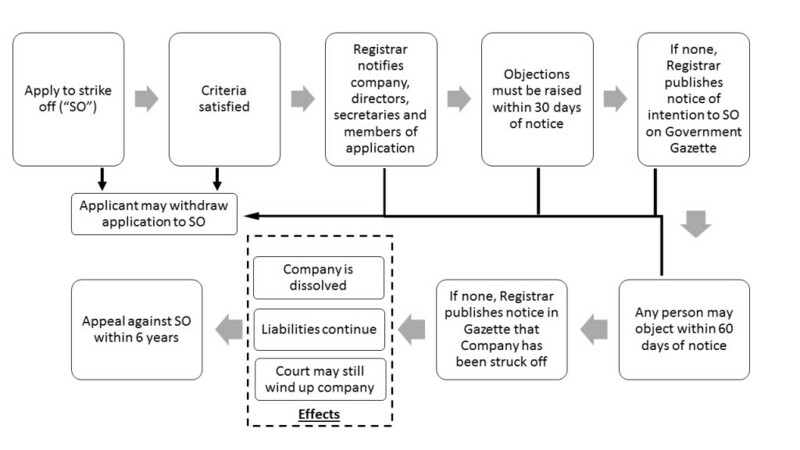 Striking off may occur on the own motion of the Registrar of Companies (i.e. ACRA). One may also want to strike off a company’s name from the register when the company has ceased business or trading, or when the objects of the company (i.e. the purpose for which the company was set up) has ceased to exist. Striking off does not absolve the company’s officers and members of their liabilities, if these liabilities had not been completely discharged. What is the difference between striking off and winding up? Winding up is another way of closing a company. However, it is a more formal process that involves the appointment of a liquidator to manage the company’s closure, such as the realisation and distribution of company assets and payment of remaining debts. If the company to be closed is not in active business, or does not have any assets or liabilities, it would be cheaper and faster to strike it off instead of winding it up. However if the company is insolvent, it can only apply to be wound up instead of struck off. The company’s affairs have been fully wound up, and the company does not have sufficient assets to pay for a court order to dissolve the company. The Registrar may strike a company off the Register on his own motion when he has reasonable cause to believe that the company is not carrying on business or is not in operation. The Registrar will first send a letter to the company and its officers (e.g. directors, secretaries and members) requiring them to reply with proof that the company is still in business or still in operation within 30 days of the date of the letter. If no such reply is received, the Registrar will publish a notice of the company’s impending striking off in the Gazette. A copy of this notice will also be sent to the company by registered post. The company then has 60 days from the date of the notice to provide proof that the company should not be struck off. If the company does not provide proof that the company should not be struck off within this timeframe, the Registrar may strike the company off the Register. If so, the Registrar will then also publish notice of such striking off in the Gazette. Once this notice is published, the company is officially dissolved. This diagram illustrates the key steps and stages involved in a striking off application. The entire process, if there is no appeal, will take at least 4 months. Who in the company may apply to strike it off? The (majority of the) company directors, the company secretary or the registered filing agent can submit an online application via BizFile+ to strike off the company. No filing fee is payable for this transaction. What criteria must be satisfied? The company has not commenced business since incorporation or has ceased trading. The company has no assets and liabilities (current/future). The company’s accounts should have no assets and liabilities. If there are assets and liabilities, the applicant must submit documentary evidence to show that the assets have been disposed of and that the liabilities have been settled or waived. For example, any debts owed to the company should be collected and any debts owed by the company should be repaid. All remaining assets (after the sale of any assets to repay debts) should also be reclaimed by the company’s shareholders. For more information on how to settle the assets and liabilities of a company being closed, refer to our article on closing a Singapore business. The directors have obtained the written consent of the majority of the shareholders. The company has submitted the last set of audited accounts (only for a public company limited by guarantee) OR the latest unaudited balance sheet (for all other companies). The company has no outstanding tax liabilities with IRAS. The company has no outstanding employers’ CPF contributions owing to the Central Provident Fund Board. The company has no outstanding debts owed to any other government agency. There are no outstanding charges in the charge register. The company is not involved in any court proceedings (within or outside Singapore). It may be useful to seek legal advice on whether these criteria have been met to prevent a rejection of one’s application, as well as to pre-empt any possible objections. Objections to the striking off application may be made within the specified periods under section 344C of the Companies Act (CA). Any objections may be made on BizFile+. No filing fee is payable for this transaction. The company is given 2 months to resolve the matter. If the company is unable to resolve the matter within 2 months, the striking off application will lapse. The company can only submit a new application after the objection has been cleared. A withdrawal of the striking off application may be made at any time before the name of the company has been struck off the register as provided in section 344B(1) CA. This application may be made on BizFile+. No filing fee is payable for this transaction. Upon receipt of such notice, the Registrar will notify the company and post a notice on ACRA’s website that the application has been withdrawn. If the company has not been wound up, the Court has the power to do so. An application maybe made to restore the company’s name to the Register after it has been struck off under section 344D CA. An application may only be made by a former director or former member. It must be made within 6 years after the dissolution of the company. The name of a company may also be restored to the Register even if the company itself had applied to be struck off. Need a corporate lawyer to assist with your legal matters?